Last week, we read about "Dreams and fantasies." This week, we hear from two more marchers who talk about dreams. One is a dream of desire and the other an actual night-time dream. Erin King sent the following: Band was always a big part of my family. My mom and both my older brothers (and now my younger sister) marched in their high school bands. When I got old enough, it was a no-brainer to join. I played flute for seven years of grade school. But in high school, I started seeing videos of drum corps (from DCI finals) that our band director would play in the band room during down time. To me, these were the ultimate marching ensembles. I loved the excitement of the shows and was inspired to be in one of these elite groups. But the problem was, I played flute. When I went off to college at University of Tennessee in Knoxville, I made the switch to mellophone for the marching band. But as a self-taught player switching from flute, I was not very good. My drum corps dreams began to fade until the summer of 2004, when I was 20-years-old (nearing the age limit). I was able to go to my first drum corps show in Sevierville, Tenn. It was so much more amazing than the videos I had seen. Every corps brought tears to my eyes. I knew right then that I had to at least try to make a corps. That fall, without my parents' permissions, I made the trek by myself to Avon, Ind. to audition for Carolina Crown. Although my mom had marched in band in high school, she didn't really understand the drum corps concept, and my dad was against it because of the costs. But camp after camp I continued to go back, amazed and excited each month that I didn't get cut. I was close to being cut until the Feb. camp. As a naturally shy person, it was difficult for me to go in and play off my music, especially for the guys in charge of whether or not I was going to make it. But when our brass caption head noticed the difference, I told him straight out, "I'm not going to let you scare me anymore. This is too important to me." When I was home, I took 17 hours of classes in order to graduate on time. Plus, I had to pay tour fees all by myself without help from my dad, so I held a part-time job at a rental car company washing cars. In between classes, I would even go sit in the lobby of the music building on campus with a cup that I decorated to read "Send Erin to Carolina Crown!" to collect loose change. (I actually made a little more than $50 that way!) I worked harder than I thought I possibly could, but to me, this opportunity was the most important thing in the world. When the summer finally came, it was a dream come true. Even when it was painful to get up in the morning, even when it was 106 degrees in the shade, I soaked it all in. By the time tour started, I was no longer considered a detriment. By mid-season, I had been added onto the "horn call," (the lead mellophone soli at the beginning of our third song) and by the end of the season I was voted one of the most improved brass players. It's all part of the experience, and I could not have asked for anything better! Now, I'm getting ready to graduate in August from the University of Tennessee in Knoxville with a degree in biochemistry and cellular and molecular biology. I've moved into my first apartment and I have a job in a pharmacy as a pharmacist tech. A year from now, I hope to be headed to pharmacy school. As for my parents, my mom became supportive when she saw how much it meant to me, and she even volunteered on the food truck for a week. She enjoyed that so much that she wants to volunteer again this summer, even though I'm not able to march again. My dad, however, still doesn't like that I did it. I hope some day he will see how hard I worked to achieve this dream and see how much I've improved as a person because of my drum corps experience. I am just so glad that I had the opportunity and that I got up the guts to audition and that I made it. I just wish I could do it again! Yohann Boscher sent in the following from France. Hi, drum corps family! I'm from the Brittany section of France (the part with Celtic roots) and to my knowledge, I am the first French person to march with an American drum corps, spending one year with Madison Scouts in 2004. I would like to thank the Madison Scouts for giving me the chance to be a member, because I had never marched in a drum corps before. I think it was an incredible challenge for them to accept me into their corps. 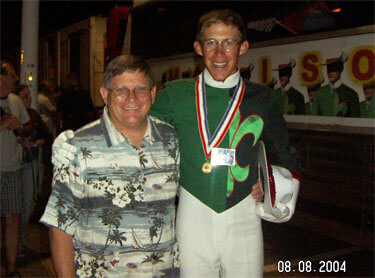 This picture was taken after the 2004 DCI World Championship Finals. Dennis drove the bus and he was a member of the Madison Scouts from 1961 to 1967. I would also like to thank Kyle and "Cajun." Kyle is a Canadian who is marching for the third year with Madison Scouts. "Cajun" came from Texas and marched with the Scouts from 2002 to 2005. During the summer of 2004, they helped me communicate with the staff because they spoke French well. They were the kind of people who fall into your life at the right time and the right place! When I arrived for the first time in Madison for the March rehearsal camp, I found the challenge to be really difficult. I had to learn all of the rules of drum corps. All my life I will remember the preparation of the show "Madisonic" during the first 15 days of June. It was mentally and physically really, really hard. But what beautiful memories! I want to share two anecdotes among thousands. During the DCI World Championships, I concentrated so hard on my performance that I almost didn't hear the audience of 26,000 people. In November of 2004, I dreamt that DCI allowed the "2004 ageouts" to continue one year more. But, it was only a dream! I had the same dream over three nights. I just wanted one thing—to march again a second year with Madison Scouts! I will keep this experience in my soul. I will remember all my life the landscapes, the laughter, the song that we listened to when we arrived close to a stadium, the stress before a show, the joy after a show, and the numerous traditions of Madison Scouts. Everyone was nice to me. Thanks to the volunteers, the staff and my 2004 brothers. The Tour of Champions in California also was a great experience. Looking back, my trip in America was the most incredible thing that I ever did in all my life. Long live the Madison Scouts! Long live Drum Corps International!